Not wanting to let shrimp go to waste (because they’re shrimp and not using them up would be a crime against both nature AND the culinary gods) I went off in search of a fried rice recipe. Kian and Sadie LOVE fried rice. We’ve taken them to Japanese teppan/hibatchi restaurants Plum Garden and Da Ru Ma (where I always order the lobster and filet mignon combo because, c’mon, how can I not?) and, on top of loving the cooking theatrics, the kids dive right into the fried rice. 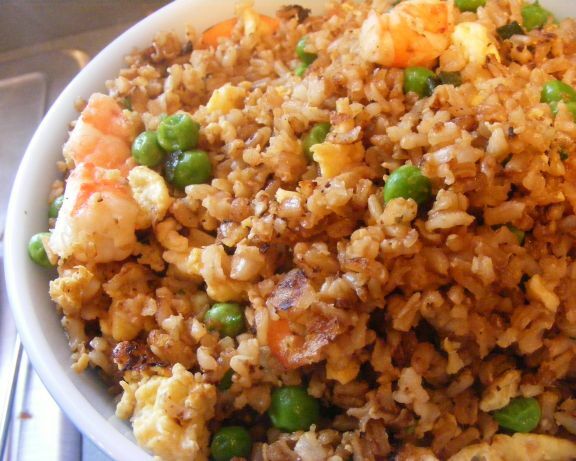 I came upon this post for fried rice by Jaden Hair, hosted on Simply Recipes — it is fantastic. Not only does Jaden provide a stand-up recipe, she explains the hows and whys behind fried rice: use day-old rice for an ideal end result, cook over high heat, fry the ingredients separately. You don’t need a wok, either. Read her post for more details. The recipe is dead simple, comes together quickly, and tastes fabulous. Plus, once you’ve tried it out, you can easily see where substitutions can be made. No shrimp? Try chicken or pork — or leave the meat out altogether and just roll with the eggs. Go vegan my swapping out the meat and eggs in favor of tofu. I replaced green onions with Bianca Di Maggio onions from my CSA (admittedly, not a *huge* difference); garlic scapes or even some diced white onion would work, too. I snuck in some whole grains and fiber by using brown rice over white rice. So, take look what you’ve got in your fridge and pantry and let your mind play with the possibilities of tonight’s dinner: fried rice. Heat a wok or large sauté pan to medium heat; add 1 tablespoon of the cooking oil and swirl to coat pan. Add the eggs, stirring to break up and scramble the eggs with a spatula (use a high-heat proof plastic spatula if cooking on a non-stick surface). When the eggs are almost cooked through (they should still be slightly runny in the middle), scoop out the eggs to a separate bowl and set aside. Wipe out the wok or sauté pan with a paper towel, add the remaining cooking oil and turn to high heat, swirling to coat. When the oil is very hot, add the green onions and fry until fragrant, about 15 seconds. Add in the rice and stir well to mix in the green onions throughout. Spread the rice all around the pan and let the rice heat up, untouched, until you hear the bottoms of the grains sizzle, about 1-2 minutes. Use the spatula to toss the rice, again spreading the rice out over the surface of the pan. Drizzle the soy sauce over the rice and toss. Add the peas, the cooked eggs, shrimp and sesame oil, tossing to mix evenly. Let everything heat back up again, taste and add an additional teaspoon of soy sauce if needed.